When Fareeha Iftikhar’s plane landed in Winnipeg last June, she says it felt like coming home. Although she currently lives in Pakistan, Iftikhar was born in Abbotsford, BC. It was her desire to study at the Canadian School of Peacebuilding that brought her back to Canada. Iftikhar was looking at professional development opportunities when she remembered meeting Wendy Kroeker, co-director of the CSOP, at the Mindanao Peacebuilding Institute in the Philippines, in 2015. “We looked at the dates and courses and (the CSOP) fit,” says Iftikhar, who works on interfaith peacebuilding projects for Norwegian Church Aid (NGA). Before joining NGA, Iftikhar worked for the Canadian High Commission in Pakistan. When the government of Canada established the Office of Religious Freedom in 2013, she and her colleagues encouraged the High Commissioner to meet with leaders of different faiths. “We did roundtables to bring together people from all walks of life for discussion and developed a network,” she says. Those discussions highlighted some of the intra-faith and inter-faith challenges facing people in Pakistan. When Iftikhar joined NGA, she knew it was something she wanted to stay involved in. The eight-episode series highlighted the contributions of people from diverse backgrounds and faith traditions in Pakistan. In her first week at the CSOP, she took Journalism and Peacebuilding with David Balzer, Assistant Professor of Communications and Media at Canadian Mennonite University. Iftikhar found the course very interesting, given her recent media experience. 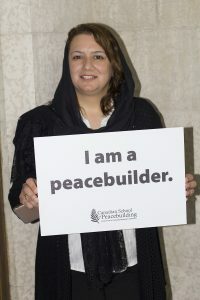 In her second week at the CSOP, Iftikhar took Practices for Transforming the Peacebuilder with Dr. Ron Kraybill, a peacebuilding consultant with over 30 years of experience, including most recently six years as Senior Advisor on Peacebuilding and Development for the UN in Lesotho and the Philippines. Overall, her experience was wonderful.